"He slept with these instruments," said equipment manager Steve Parish, who handled Garcia's guitars for more than 25 years. " You could lose amps. You could break things, and sometimes we did. 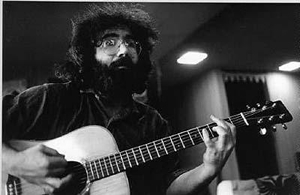 But I could never look Jerry in the eye and say, 'I don't have your guitar." 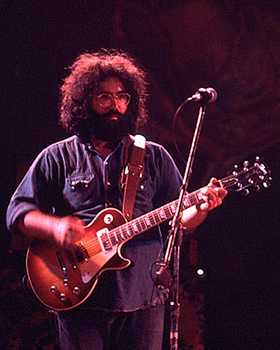 Jerry had about 25 guitars, but 70% of his time in the spotlight he played just 3, all custom built by the same luthier. His first was a Danelectro (age 15). His acoustic in the days with Robert Hunter prior to his switch to the banjo is uncertain. 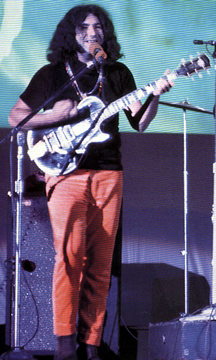 With the Warlocks in '65 age 23 he played a red Guild Starfire, also used on the 1st Dead albumn. and switches back to the Strat that Graham Nash gave him, with Alligator sticker. 72- cont. 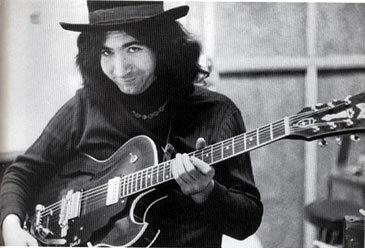 Garcia bought the first guitar Doug Irwin ever made for $850 (known as 001) and ordered another one custom-made. By this point, his silverface Fender Twin amp was already a central part of his sound. He continued to use the preamp from the Fender amp through 1993. From the late '70's to about 1993 he didn't use the power amp & speakers of the Fender, instead using three JBL D120/E120 speakers in a vertical box powered by a McIntosh solid state amp (note that this probably made the power amp Class A, which is not the Class AB power amp that the Fender normally has). It was miked with a Sennheiser 421 mic. 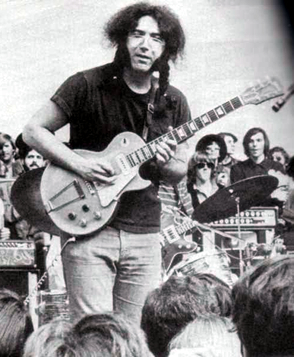 *1972-1974 the wah pedal is a ColorSound "Vol + Wah"
Jerry, "I don't like any guitars that are available. I'm trying to have a guitar built." Hence, the Travis Bean. He laughed upon first seeing it, but quickly changed his mind when he tried the custom aluminum-neck guitar made in San Francisco. 1976- Travis Bean TB500 w/single-coil pickups and fx loop. 77- Fall Jerry get's his modified Wolf back from Doug Irwin. Complete with single coils and effects loop. Irwin removes the Wolf sticker and Inlays the Wolf into the guitar. He also removes the Peacock on the headstock and adds his signature Eagle logo. "Tiger" (pearl coverplate) Description: Seven years to make, ebony fingerboard on maple neck, an arched cocobola top and back, vermilion neck and body striping, and W. flamed-maple body core. Meticulous scrolled inlay finger position markers and hand-crafted brass hardware; Strat approach, but with one DiMarzio SDS-1 single coil and two DiMarzio Super 2 humbuckers that were easily removed 'cause Jerry thought their ouput weakened after a year or two. 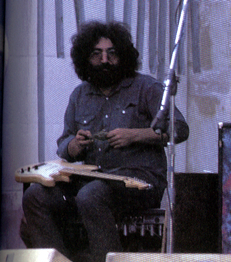 Also had Jerry's effects bypass loop (he knew his electronics! ), as well as an op-amp buffer/amp to maintain the high end during effects "on". Result: Garcia's favorite guitar for the next ll years & most played. 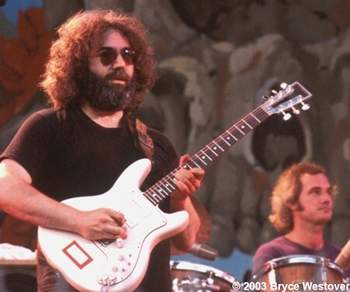 Jerry strapped this heavy 13 1/2-pound guitar for 11 years. 1989- Fall tour (notiably the Hampton Warlocks show) Wolf briefly came out of retirement as a guinea pig for MIDI synthesizer experiments. 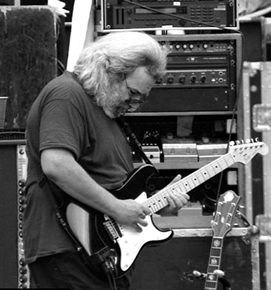 In the 1989 Jerry mounted a GK-7 synth interface on the Wolf. Mated to the GK-50 controller. After a Roland synthesizer was successfully attached to Wolf, San Francisco repair expert Gary Brawer later retrofitted it internally. Tiger went back to the shop for retrofitting. 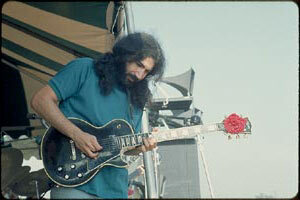 Garcia used the synthesizer attachment to make his guitar sound like a trumpet or other instruments. 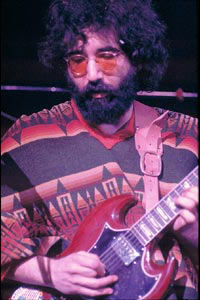 Jerry played Tiger for another year for Garcia Band Shows. 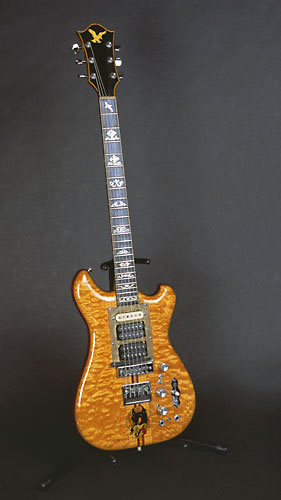 1993- The Stephen Cripe guitar "Lighting Bolt"
Garcia's next guitar arrived in the mail at the Grateful Dead office in 1993. Stephen Cripe, a 39-year-old Florida woodworker who spent years building custom interiors for Caribbean yachts, decided to try his hand at making a guitar. Using a few photos and a well worn "Dead Ahead" video., he knocked off Irwin's design of Tiger with a few flourishes of his own, like carving the body out of a piece of East Indian rosewood recycled from a 19th century Asian opium bed. It had an acoustic piezo pickup built in. Built "totally by feel", the cocobola through-body neck has a recycled Brazilian rosewood fingerboard (note: Jerry's interest in the rain forest) with an unusual accuracy in the higher end allowing him to play where he usually avoided.
" 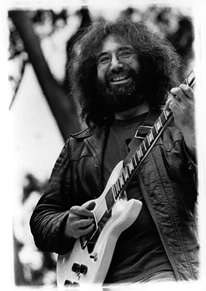 Garcia was amazed when it came around," said band mate Bob Weir, "at the guesswork he had to make -- and got right -- to give that guitar Irwin's look and feel. It was astounding." 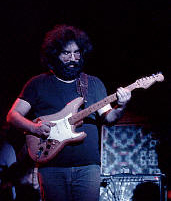 Garcia gave the piece to San Francisco repairman Gary Brawer to fix the electronic guts, but it was a miracle guitar. In April of '95 Jerry ordered the backup "Top Hat". 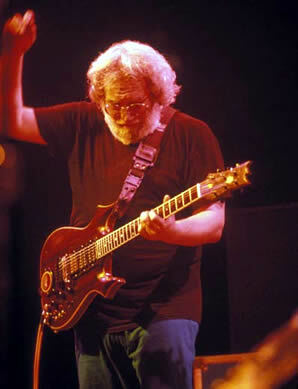 1994- Summer Tour Jerry brings back out Rosebud but in the fall back to Lightning Bolt. 1995- Lightning Bolt was in the shop on the last tour. 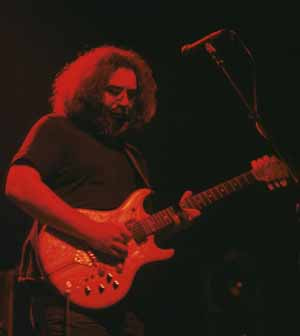 In his final show at Soldier Field in Chicago on July 9, 1995, Garcia started out playing Rosebud, but midway through the show, the guitar developed problems. Garcia strapped on the tour's spare guitar -- Tiger, out of mothballs for the occasion -- and finished his final concert on his old trusty ax. 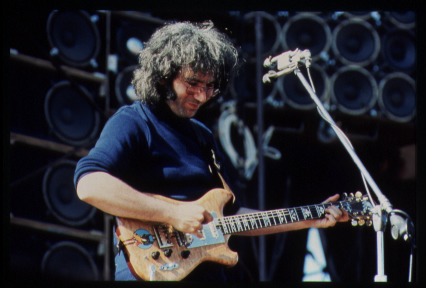 Martin D-18 "American Beauty", "Wokingman's Dead"
Jerry used "Rosebud" at the last Grateful Dead show in Chicago. On Aug 4, 1995. 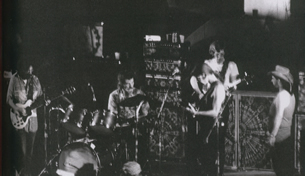 Effects used during the early '70's were limited mostly to the Vox wah-wah pedal being occasionally used. By the late '70's, he was using the Mutron envelope filter (which was used for Estimated, Shakedown, etc. ), and he continued to use it until the very end. A Mutron Octive Divider, MXR Distortion +, Phase 100 and Analog Delay. By the late '80's, his effects consisted of mostly Boss effects: Octave Divider, Turbo Overdrive, Super Overdrive, EQ's, etc. in two effects loops. He also used some extremely expensive Lexicons a PCM-42 or PCM-60, with a PCM-70) reverb/delay units in the rack behind him; these are studio units. By 1993, he was using these effects, but used a Groove Tube TRIO preamp as well as a Real Tube Reverb unit to go direct to the soundboard, when all of the power amps & speakers were removed from the stage. They used in-the-ear monitors instead of floor monitor wedges. 8/4/67 - ditto,but this guitar has a Bigsby tailpiece/tremelo bar. It could've been installed,or could be a different axe. 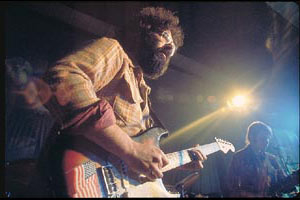 10/24/69 - sunburst Strat. 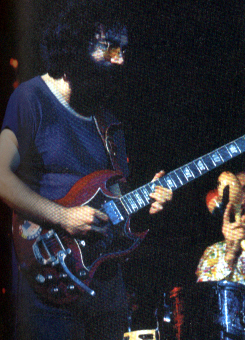 He's pictured playing this one on several 1970 dates,but he's back on an SG on 5/6/70 and pics captioned "1970" on p.257 in the Compendium. 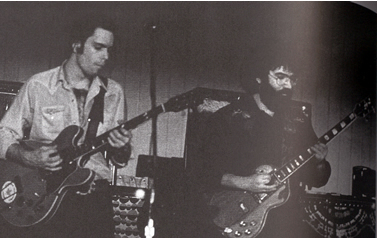 The SG gets some studio use w/Crosby,12/70. 3/24/71 - page 310. Looks like a Les Paul neck on a handmade body. I'll take a guess that it was an early effort from the Alembic guys, because the raised pickguard appears to be made of hand-cast metal,and they were into that. 4/71 - page 313. Same guitar or a Les Paul? I can't tell. 4/72 - natural finish Strat.As heard on Europe '72. early '77 Travis Bean MC500 recieves Jerry's first unity-gain buffer/fx loop jack combo, placing all effects in front of Jerry's gtr vol. knob. '82 "Tiger" gets pickup change:(b,m)Dimarzio Super 2,(n)SDS-1... that.